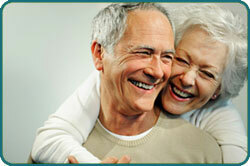 At Avon Smiles we understand that seniors have unique dental needs. Please feel free to contact us to set up an appointment or even just to discuss your special needs as a senior patient. Good dental care is essential but often neglected because seniors do not have dental insurance and must pay out-of-pocket for all dental services. However oral heath problems can affect overall health. Poor nutrition sometimes stems from trouble chewing, difficulty swallowing due to too little saliva, or ill-fitting dentures that work poorly or hurt. Gingivitis (gum inflammation) and periodontitis (advanced gum disease) may have broader health implications. Increasing evidence links gum disease to heart disease and diabetes. Regular dental checkups and professional cleanings are important, as well as proper brushing, flossing, cleaning the tongue and regular denture cleaning.